A couple of weeks ago I looked at a breakdown of how the market has performed historically in relation to some longer-term moving averages. Today I’m going to take the same approach, but instead of using the 200-day and the 50-day for study, I’ll look at the 50-day and 10-day. This chart is very similar to the same quadrant when looking at the 200/50 test. 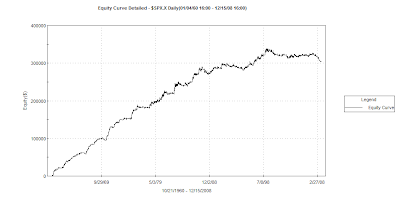 Good follow through was seen when the market was near its highs up until about 1988. 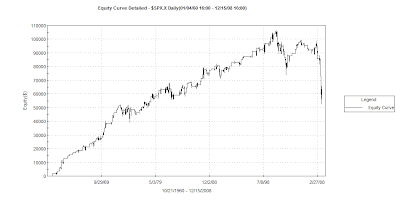 From 1988-2000 the edge was weaker. Post 2000 is has been non-existent. Even the latest bull market from 2003-2007 failed to make much headway when trading above these two lines. I noted a few weeks ago that bull market saw little in the way of enthusiasm near highs and this is more proof of that. The next chart shows performance after the S&P closes above the 50 but below the 10-day moving average. During the 60’s and 70’s this was not a place to be buying. Since the late 80’s this quadrant has generated some nice returns. The shape here is again somewhat reminiscent of the 200/50 chart of the same quadrant. Now quadrant 3 – Similar to 2 weeks ago this is where the market has spent the least amount of time. Again somewhat similar to the last test. This quandrant has done fairly well historically – mostly as the market emerges from below. The last two bear markets have seen some steep losses from this area, though. During the 60’s and 70’s this quadrant consistently lost money. 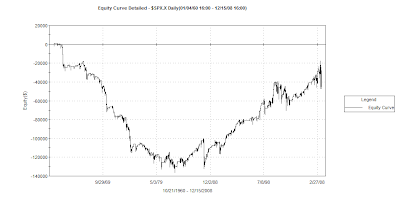 Since the mid-80's pullbacks into this quadrant have often been buying opportunities. It has suffered during the last 2 bear markets. This suggests you're beter of attempting longs in this quadrant during a bull market. 1) Whether using the longer 200/50 moving averages or the 50/10 moving averages the results look fairly similar. 2) It’s been a good 10 years since chasing strength worked and a good 20 since it’s worked well. 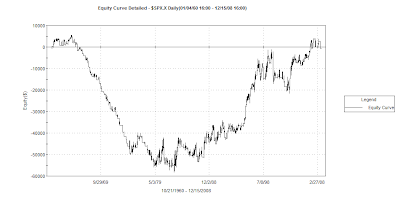 3) Pullbacks in uptrends have provided the best long-side opportunities over the last 20 years. Hi, there is some technical issue about this study i want to ask. If the index cross e.g. above 50 and 200MA, do you buy at next day open, or the last close.